Where is The Black Adder filmed? 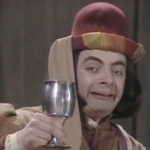 First shown in 1983, The Black-Adder - sometimes known as Black Adder I - is set in the 15th century. Written by Richard Curtis and Rowan Atkinson, the series took a liberal view of history, presuming that Richard III didn't murder the princes in the Tower, and one of them grew up to be Richard, Duke of York, later Richard IV. The six-part sitcom starred Akinson as Edmund, Duke of Edinburgh, younger son of Richard IV, who styled himself as "The Black Adder". Edmund was stupid, and he was aided and abetted by his equally dumb cohorts Baldrick (Tony Robinson) and Percy (Tim McInnerny). A fine concept, ultimately it proved an expensive series with complicated location shoots and set and costume design. It won an international Emmy in the popular arts category in 1983, which was just sufficient acclaim to persuade the BBC to make a second series. A radical rework, a new writer (Ben Elton) and a new period (the Elizabethan era) gave us the classic comedy Black-Adder II.